Jill – Daina springs just around the corner, have you been noticing an increase in people looking for mortgages? Daina –Yes!! We definitely have. Spring is always a good time to start looking. 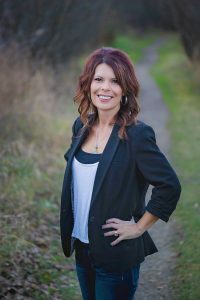 Jill – Well any tips for people here in Grande Prairie who are looking to purchase a home this spring? What can they do to make everything go smoothly? Daina –Save for your down payment, pay down debt and file your taxes to make your financing a smooth process. Jill – Any big plans for spring this year? Ready to clean all that clutter? 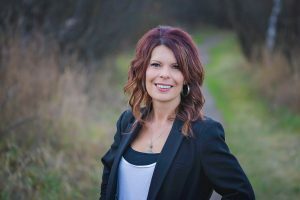 Daina- No big plans since this is a busy time of year for those of us in the mortgage industry, but it is a great time to paint that room, clean up your yard or simply do some Spring cleaning. 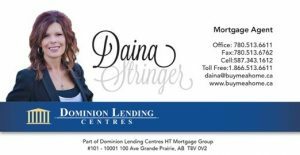 Daina Stringer Dominion Lending Centres HT Mortgage Groups associate of the week! She makes moving in the spring easy, so give our office a call today to start your spring move! My name is Daina Stringer. I completed my degree in 1997, and after working a few years, I joined the mortgage industry in 2000. I’ve been in this industry for 16 years and with Dominion Lending Centres HT Mortgage Group since 2011. Coming from a banking background for many years, I was grateful for the change in pace that came with switching to a Mortgage Brokerage. This has given me the opportunity to not only offer my clients a wider range of mortgage products, but also the ability to get to know my clients on a more personal level. On a personal note: I have lived and worked in Grande Prairie for the last 27 years and truly enjoy our community and everything it has to offer. When I am not in the office I enjoy spending time with my husband, Russ and our 2 children.